America's national Prohibition lasted from 1920 to 1933 and was supported by groups as diverse as the Christian Women's Temperance Movement and the Ku Klux Klan. Intended to banish poverty and vice, and despite the fact that consumption fell, deaths from alcohol poisoning soared as poor quality moonshine replaced well-made products now deemed illegal. At the height of Prohibition, New York boasted 100,000 speakeasies and the likes of Al Capone controlled bootlegging rackets stretching from Canada to Florida. Prohibition in the United States seems to be a period in history that leaves many modern mixologists pining for the raucous days of speakeasies, flappers, bootleggers, and hip flasks. But were they really the good old days? Did Prohibition really inspire a generation of adults to act like school kids, seeking new and ingenious ways to sneak a sip behind closed doors with a wink and a giggle? 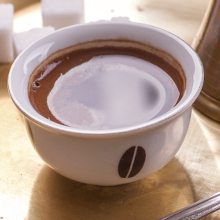 Was it truly a time of great inspiration for daring young mixologists? Or can we remove the rose-coloured glasses for a moment and see the "Great Experiment" as something much darker - a political, evangelical, chauvinist-driven movement that seized the land of the free and the home of the brave by the throat? Why did Prohibition happen? Simple. The development of potable public water had given politicians and evangelicals a shiny, healthy sword to wield against the "devil drink", and anyone with a conservative agenda saw temperance as the perfect launch platform. That such a moral high ground could have developed in the first place would have been unthinkable even a few decades before, when water might contain a baker's dozen of diseases, not the least of which were typhoid, cholera, E-coli, and dysentery. From Shang Dynasty China through the Age of Enlightenment, humans knew that a cup of wine, a tumbler of beer, a dram of spirit could keep your digestive system intact and help you live past thirty! The simple fact was that humans began to live longer after the discovery of fermented and distilled beverages. At the dawn of the 19th century, when water was downright dangerous, the average American consumed about 7 gallons of spirits per year, consisting mostly of rum, brandy, gin, and whiskey. Coffee and tea were expensive imports and ale and stout had a short shelf life. The Pilgrim Fathers widely believed that the "drinking of water would infect (their) bodies with sore sicknesses and grievous diseases." Cold water was perceived to be dangerous, especially during the summer. Public water pumps in Philadelphia bore signs that read: "death to him who drinks quickly." In New York City, sewage fouled the East River and the Hudson River, as well as Manhattan's shallow, mosquito-ridden wells and springs. As New York's population began to burst at the seams the cry for fresh water prompted the city, in 1837, to construct an aqueduct to convey water from forty miles north in Croton to a reservoir situated in what eventually became Central Park. Liquor consumption waned with the arrival of fresh, cold water, and not just in New York. It is estimated that by 1845 American alcohol consumption nosedived to a little over 1.5 gallons per year. A discovery by a brilliant young German chemist named Johann Tobias Lowitz back in 1785 also served to transform the way city dwellers lived nearly a half century later. He showed that merely shaking grain spirits with powdered charcoal easily removed oils and esters that made some spirits taste so rough. This improved the quality of vodka, rum, and other neutral spirits, and also inspired people such as Henry Doulton, who designed ceramic water filters charged with manganous charcoal to remove bacteria from water. Potable water was undeniably a revolutionary concept on both sides of the Atlantic. It also finally gave religious radicals a leg to stand on, marking a new and powerful chapter in a movement against the consumption of alcohol that had actually begun soon after the American Revolution, born out of a small pamphlet published by one of the signers of the Declaration of Independence. In 1789 a group of 200 Connecticut farmers had campaigned to ban whiskey-making, just as production by emigrant Scots-Irish was on a meteoric rise and giving New England rum distillers a run for their money. With this influx of foreign distillers, they rallied behind by a 1784 pamphlet written by Dr Benjamin Rush titled An Enquiry into the Effects of Spirituous Liquors upon the Human Body, and Their Influence upon the Happiness of Society. Rush was not a prohibitionist. Based on his observations of binge drinking amongst soldiers during the American Revolution he believed that alcoholism was a treatable disease. His message was moderation, but many fervent evangelicals preaching in rural areas believed total abstinence was the only cure. They twisted his words to fit their cause. The call for the restricted sale and consumption of "ardent spirits" resounded in eight states, beginning with Virginia (1800) and New York (1808). Preachers proclaimed from their pulpits that binge drinking led to moral corruption, prostitution, spousal abuse, and rampant crime. Two campaigns that had not gained sufficient ground in their own right, the abolition of slavery and women's suffrage, were also added to the platform as this movement took shape. The American Temperance Society (ATS) was formed in Boston on 13 February 1826 by preachers Lyman Beecher and Dr Justin Edwards and their push for social reforms soon echoed throughout the nation. Within a decade, the ATS boasted 1.5 million members, 10 per cent of the country's total population. Activists campaigned hard. They informed employers that serving alcohol to workers as part of their daily rations reduced productivity. They told women that liquor made their husbands less reliable. But it took something stronger than a religious movement to sway the urban mainstream. America during the mid-1840s experienced its first major flood of immigration. Germans seeking political and intellectual freedom arrived bringing with them their own cultural traditions: the Christmas tree, kindergartens, hot dogs, hamburgers, and something to wash them down. Then the influx of refugees of the failed old country revolutions of 1848 brought even more professionals and entrepreneurs. They introduced a new refreshment - lager. Nicholas Seitz opened a lager brewery on 13th Street in Manhattan that year, catering to the growing number of beer gardens that had sprung up in Greenwich Village. These places weren't saloons. The beer garden was a family-oriented institution, where drinking lager was just one of many attractions. The beer garden afforded husbands, wives, children and friends the opportunity to socialise in their own language, listen to musical and theatrical entertainment, savour weiner schnitzel and sauerbrauten, as well as capitalise on the fresh air of a verdant garden space. Castle Garden, Madison Square Garden, the Bohemian Hall and Beer Garden were only a handful of the hundreds establishments that opened, much to the dismay of respectable New Yorkers and of another hearty-drinking immigrant group - the Irish. The Great Irish Famine, between 1845 and 1852, instigated a mass exodus of impoverished tenant farmers and labourers. Unlike their German counterparts, the newly-arrived Irish were not so wealthy and educated. Many were from small villages or the countryside, and they imported a taste for whiskey, stout, and tavern culture. Hundreds of saloons opened their doors on the Bowery and in the notorious Five Points district, catering to this newly transplanted population who found themselves universally unwelcome elsewhere in New York and beyond. Signs reading "No Irish Need Apply" sprang up under every "Help Wanted" sign. Now temperance became a patriotic issue that saw its apotheosis in the formation of the American Party (aka: the Know-Nothings, who limited their membership to American males of British descent and campaigned against immigration). As a way to highlight the cultural differences between immigrants and "native" Americans, leaders pushed for prohibition to Americanise hard-drinking foreigners. The party managed, in 1851, to pass a prohibition law in Maine. During the next three years, that prohibition spread to 12 additional states. Joining the semi-dry states in 1855, the State of New York passed an act "Regulating the Sale of Liquors" as well as an act "To Suppress Intemperance, Pauperism, and Crime" that stated: "No inn, tavern, or hotelkeepers, or persons licensed to sell liquors shall sell or give away any intoxicating liquors or wines on Sunday, or upon any day upon which a general or special election or town meeting shall be held..."
Why close up shop on Sundays? Most men worked a six-day week and Sunday was the only free day left for drinking and socialising. Proprietors, mostly Irish and German, made their best money on the Lord's Day when their establishments filled to bursting. It appeared to be a major victory for temperance advocates, even though it was selectively enforced. Then the Know-Nothings were dealt a fatal blow. Abraham Lincoln's campaign against the expansion of slavery beyond the Southern states not only won him the presidential election, it triggered the American Civil War and brought about the demise of the Know-Nothings who fractured over the slavery issue. As the fighting escalated, the Union Army called for a draft. Wealthy men paid the hefty $300 Commutation Fee to dodge the draft but the Irish, Germans, and working-class Americans were pressed to take up arms. Since the Revolution of 1776, hearty drinking was a long-standing institution amongst American soldiers. The Civil War was no different. Before the Confederacy surrendered, all but three New England states repealed prohibition. Halfway through the war, beer and liquor were taxed to defray military expenses. Six years later, that tax increased tenfold, but the rise did not impact on alcohol consumption. Civilian pressure escalated. Outside of the major metropolises, evangelical preachers stirred up the passions of rural Americans, especially women. The Women's Christian Temperance Union (WCTU) held its first national convention, in 1874, in Cleveland, Ohio. Its platform of social reforms saw prohibition heading a list that included the enactment of labour laws to protect working women from exploitation by male employers, a ban on prostitution, and a Sunday ban on frivolous activities such as golf. "Un-American" women such as Catholics, Jews, African-Americans, and foreigners were not accepted into its membership. Leaders firmly believed that foreigners, especially the Irish and Germans, were prone to alcoholism and responsible for its spread. New York, with its immigrant population and its proliferation of saloons and beer gardens featured heavily in the WCTU's propaganda. From 1874, a few state governments adopted a new tactic to reduce alcohol consumption: raise the price of a liquor-selling licence (around $500-1,000, roughly $12,000-24,000 in today's currency). But rampant smuggling and unlicensed sales kept working class families supplied, while middle class drinkers found a new option. Intended to reduce the number of bars, the 1888 Brooks High-License Act raised the saloon licensing fee in Pennsylvania from $50 to $500. Instead, it gave the world a new term - "speakeasy". As an Ohio newspaper reported: "In Pittsburgh, they call a place where liquor is sold without a license a 'speak easy'." It is likely the trend began in McKeesport, just outside Pittsburgh, where illegal saloon operator Kate Hester was known to hush raucous patrons by whispering, "Speak easy, boys!" Soon it was popularised in Philadelphia, and the notion spread from there that drinking in an unlicensed establishment implied the habitués had to speak "easy" (softly) to escape the notice of the police. However, this is not the expression's origins. A parable had run on and off in newspapers across the nation for at least twenty years about a father speaking crossly to his young son, and the son replying with a tearful entreaty, "Speak easy, Father." It went on to encourage all family members to "speak easy" to create a spirit of harmony in the household. So, the term had already been pressed into the minds of the masses for a few decades before it found a usage those masses would readily adopt. In this parable, "speak easy" did not mean using a password. It meant keeping a civil and polite tongue. The term, used in this context, appeared outside this parable as well. A number of writers, critical of Americans avoiding conflict at all costs and steering clear of any difference of opinion to the keep peace, said America was in danger of turning into "a giant speakeasy through the opposition of some people to conversation". Thus, at a time when drinking was negatively associated with boisterous behaviour and crime, "speakeasy" was also a lesson in polite and responsible drinking. Words that would be proven beyond dispute decades later, appeared in New York's The World, in 1895: "The 'speak-easy' has always been the result whenever Prohibition has been attempted...If we had no intolerant crusade, we would have no 'speak-easies'." Yet the cry for prohibition was a mere whisper west of the Mississippi River. Between 1860 and 1900, the number of bartenders and saloon owners from Kansas to California rose from under 4,000 to nearly 50,000: 40 per cent were recent immigrants, 25 per cent of those were of German descent. However, unfettered drinking in the west didn't last long. In June 1900, God spoke to one Carrie Nation, a six foot Kentucky-born advocate of temperance who now gained divine approval for her cause. Responding to this epiphany, she gathered several "smashers" (rocks), headed to Dobson's Saloon in Kiowa, Kansas, and announced: "Men, I have come to save you from a drunkard's fate." She decimated the saloon's entire stock with her arsenal. Dramatically wielding a hatchet, she repeated her performance at two other watering holes in the town. Then continued her rampage through Missouri and was arrested more than 30 times within a decade. Carrie Nation finally collapsed during a speech, on 9 June 1911, died, and was buried in an unmarked grave in Belton, Missouri. The Women's Christian Temperance Union later erected a tombstone with her epitaph, reading: "Faithful to the Cause of Prohibition, She Hath Done What She Could." Feminism took its first steps thanks to Carrie Nation and the WCTU, as the first real blows rained down on alcohol, a significant stepping stone to the beginning of the Noble Experiment. The gloves were off. To put the period immediately before Prohibition into context, the First World War officially commenced on 28 July 1914, when Austro-Hungary invaded Serbia, and Germany invaded Belgium, Luxembourg and France. Although America did not enter the fray until 6 April 1917, anti-German sentiments began boiling following the death of 128 Americans in May 1915 during the sinking of the RMS Lusitania by the German submarine U-20. Newspapers in New York and other cities published the names and addresses of German-Americans, labelling them as "enemy aliens" and the Red Cross barred German-Americans from volunteering for fear of sabotage. Mob violence ensued in the midwestern states - home to many 'German' lager breweries. In November 1917, President Woodrow Wilson issued a proclamation, restricting the employment and travel of German-American males over the age of 14. The New York Times reported that the order directly affected 130,000 men in greater New York City and northern New Jersey alone. Prohibitionists climbed on the bandwagon by claiming that it was patriotic to conserve grain for the war effort: drinking beer or alcohol was therefore unpatriotic. Brewery output took a downturn and German-owned bars and beer gardens saw a precipitous decline in patronage. The Great War, in effect, aided the cause of the Women's Christian Temperance Union whose platform had included women's suffrage. 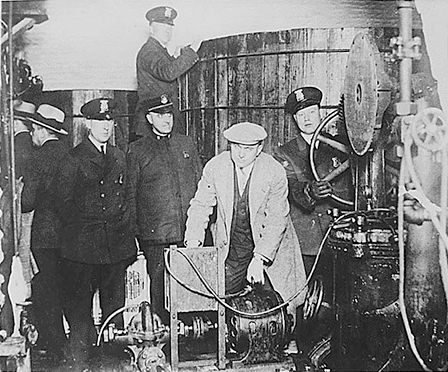 The WTCU accused the United States Brewers Association of funding anti-suffrage activities and in 1919 a US Senate investigation was launched to investigate this allegation. But it was the Anti-Saloon League that wielded the strongest sword, implementing pressure politics to stir citizens up to a patriotic frenzy - a true American nation had to be a dry nation. President Wilson had already committed political suicide by not immediately involving American troops in the war. To top it off, he also strongly opposed prohibition. 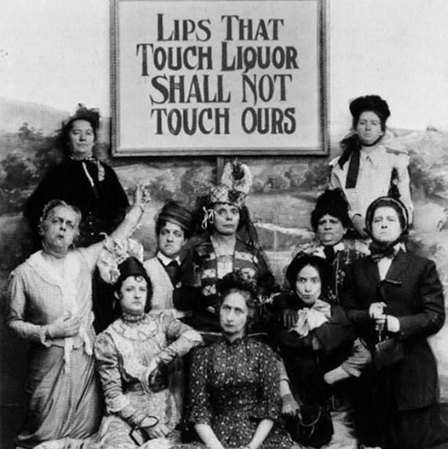 The pressure from both prohibitionists and women's suffrage lobbyists was too great for Congress to bear. Any senator or state representative who had not been placed in office by the Anti-Saloon League and other groups soon realised that re-election to office meant succumbing to their pressures. On 18 December 1917, the Eighteenth Amendment to the US Constitution (aka: the Volstead Act) was passed by Congress. Ratification by 36 states was completed on 16 January 1919, when Nebraska gave its approval. Wilson lost ground, except in Connecticut and Rhode Island, which were the only two states to reject the amendment. He appealed to Congress to pass the Nineteenth Amendment, guaranteeing women's suffrage in 1915, 1918, and early 1919. The clock ticked closer toward the March 1920 presidential election. He called Congress to a special session on 21 May 1919. The amendment was finally passed, but it was too late to save his career. So what exactly did the Volstead Act herald for alcohol? In part, it stated: "After one year from the ratification of this article the manufacture, sale or transportation of intoxicating liquors within, the importation thereof into, or the exportation thereof from the United States and all territory subject to the jurisdiction thereof for beverage purposes is hereby prohibited." In plain English, this effectively quashed production and sale of all forms of alcoholic beverages in the United States. Out on the streets, the liquor industry in one city had actually imploded the day before ratification. On 15 January 1919, at 12:40 PM the people of Boston found out that normally inert molasses could move at surprisingly fast speeds, even in January. The temperature soared from -17C to +6C in a single morning. At the United States Industrial Alcohol Company's yard, a 90-foot-wide cast iron tank filled with crude molasses awaiting transfer to the Purity Distilling Company on Willow Street ruptured, spilling its contents down Commercial Street. A 5-metre-tall tsunami of 9.5 million litres of molasses slammed through the elevated railway's Atlantic Avenue station, breaking the girders and lifting a train off the track. The North End pier was shoved into the harbour by the force of the wave. North End Park became a lake of molasses. Twenty-one people and a dozen horses were drowned in the sticky mass. One hundred and fifty people were injured. The Great Molasses Flood marked the demise of New England rum production. 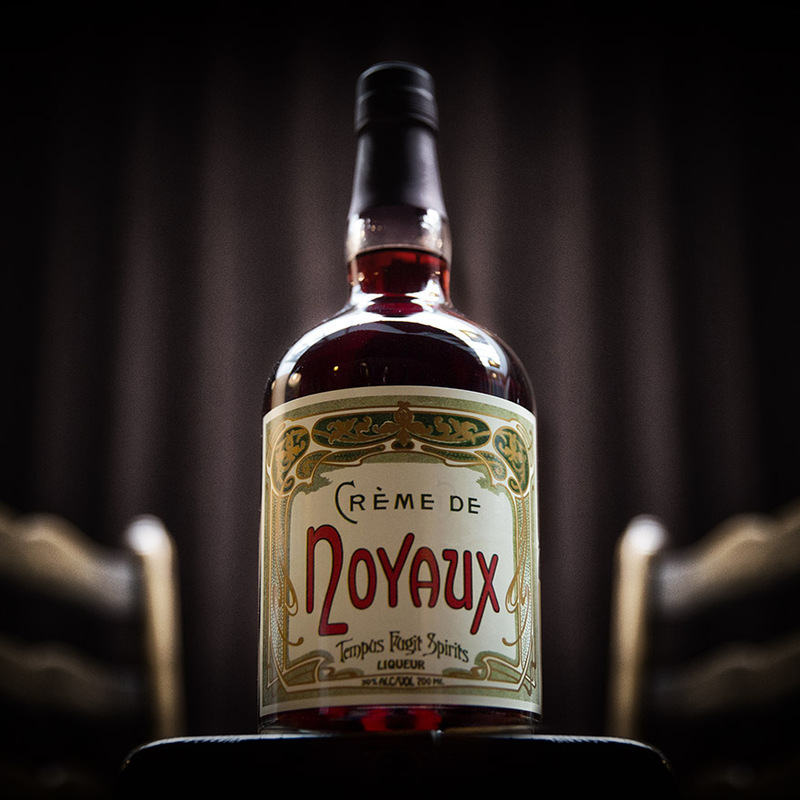 The region had risen from the 1640s to become the world's largest rum producer. But when church bells rang across the city the next day, it was not for the dead - rather callously, the people were celebrating the Volstead Act's ratification. 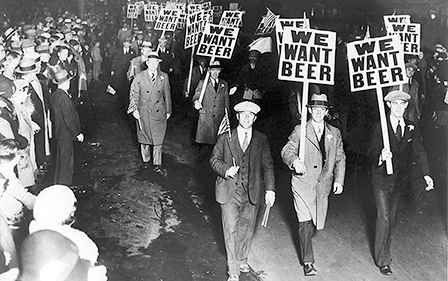 When Prohibition went into effect, on 16 January 1920, it wasn't as if Americans couldn't find a drink. Possession and consumption of liquor on private property was still legal. Wealthy Americans had stockpiled private cellars of wines and spirits, both domestic and imported, in their homes and funded the inventories for their private clubs. The White House itself was well provisioned with private stock of spirits brought in by newly-elected president Warren G Harding. A handful of forward-thinking American and Canadian businessmen including Joseph P Kennedy and James Roosevelt (Theodore's son), formed a securities trust in 1925. They sunk their money into foreign distilleries, betting that share prices would skyrocket with repeal. Although many talented bartenders such as Harry Craddock and Eddie Woelke headed to Britain and Cuba, respectively, to ply their trade serving wealthy American tourists, some managed to maintain or secure domestic posts in country clubs including Tom Bullock who remained at the St Louis Country Club, serving wealthy gentlemen such as George Herbert Walker, George W Bush's grandfather. Others such as Henry C Ramos, who was in his sixties, simply closed the doors to his place and retired while his staff relocated to Mexico. The "wet" religions (Roman Catholic, Eastern Orthodox, and Episcopalian churches) purchased communion wine from government-bonded warehouses. Private citizens were permitted to produce small amounts of wine and hard cider for home consumption. In fact, US Department of Agriculture labels on California grape juice clearly stated that if the juice were allowed to ferment for 60 days, it would yield a 12% abv wine. Breweries with their own malting facilities such as Anheuser-Busch, Pabst, Miller and Schlitz survived by selling malt extract syrup for baking and "beverage" purposes in malt-and-hop stores as well as making "near beer" (lager that was produced full strength, diluted to 0.5% abv and labelled as a "cereal beverage"). 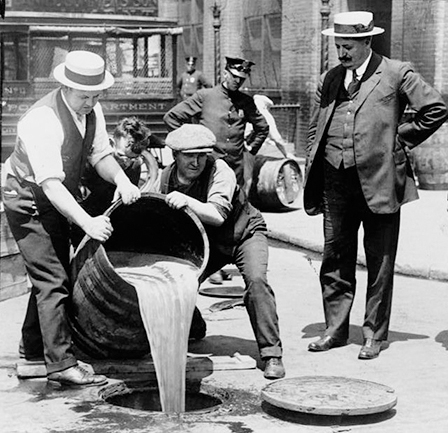 Often, alcohol was added by illegal sellers who injected it through the keg or bottle. Thus it was called "spiked beer" or "needle beer". Pharmacies became liquor purveyors. A smart imbiber would find one of the 35,000 physicians who were licensed to write a prescription for "spiritus frumenti" (corn spirit) to be administered orally once, twice, or thrice a day. 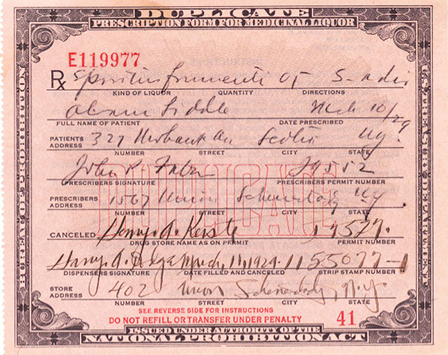 Prescriptions were valid for only seven days, but they were easily renewed. The spirits produced by the American Medicinal Spirits Company (who formerly produced Old Grand Dad Whiskey) were dispensed to treat every imaginable illness, from indigestion to nervous tension to catarrh and the vapours. Stored in 27 warehouses across the nation were 15 million gallons of whiskey: enough to fulfill millions of prescriptions. However, this was not the only drink prescribed. A few went so far as to specify Champagne. There were pharmacies that also imported and dispensed another product. Digestive bitters were not banned. Campari and Fernet Branca were readily available in the United States and could also be brought home openly by tourists returning from Europe. Fortunately, the governing American palates could not imagine that other cultures would drink these bitters for pleasure. American whiskey was always a rebellious spirit. Colonial producers had moved to western Pennsylvania, Kentucky, and Tennessee to ply their trade in the freedom offered by the wilderness and thus defy George Washington's 1791 Whiskey Tax. Many of their descendants resumed the ancestral battle cry against the government. Although legal distillers shut down their stills, moonshiners continued their generations-old tradition of making "white mule". According to Federal chemist John W Fonner, who was in charge of testing confiscated samples, the best moonshine came from Peoria, Illinois, which boasted 73 whiskey distilleries (not including 24 breweries) prior to Prohibition. By 1922, he had already analysed nearly 26,000 samples of illicit "white mule" from around the nation and speculated that the spirit's superior quality was due to the city's talent pool out-of-work distillers. Jerry-rigged stills built from copper pots and condensers made from old automobile radiators, washtubs, hot water boilers, and kettles made moonshiners into the unsung heroes in rural areas. But the spirit they yielded was oft-times lethal. Glycol and lead poisoning from the radiators and the welds gave way to the adage "lead burns red and makes you dead". To increase the final spirits' apparent alcohol content, some nefarious moonshiners added methanol or lye to increase the burning sensation. 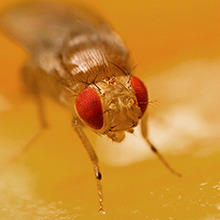 Many imbibers went blind, and many died. Cake flavourings found in the baking goods sections of grocery added glycerine (to add sweetness and smoothness) plus "artificial" rum, brandy, whiskey and gin extracts that could be mixed with the spirit and water. 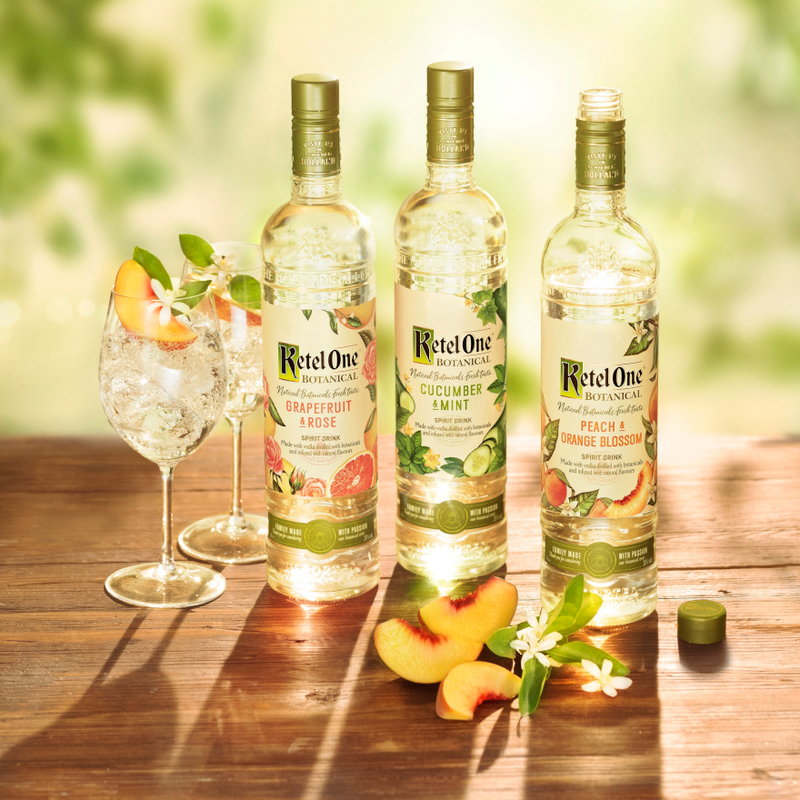 Because the preferred bottle used to package the final product was too tall to be topped off in the sink, the finished spirit was sometimes diluted using the bathtub tap. Thus, bathtub gin was born. Even in skilled hands, the final product was only as good as the cheap essences and rough base spirit. "Blind pigs" and "blind tigers" had been around as long as speakeasies, but had more in common with dive bars than classy cocktail lounges. Spiked beer, rotgut, and moonshine were the free bonus where payment of a 25-cent admission fee granted a patron a look at a Greenland pig or other exotic creature. Popular in the Deep South, a "blind tiger" was an illicit whiskey shop that operated out of a private house. Printed instructions posted above a hole in the side of the house explained what to do: the patron had to place an empty bottle and money into the hole. Within a few minutes a full bottle of whiskey was returned through the same hole. New York City alone, by the late 1920s, reputedly sported over 100,000 speakeasies, blind pigs, and blind tigers. 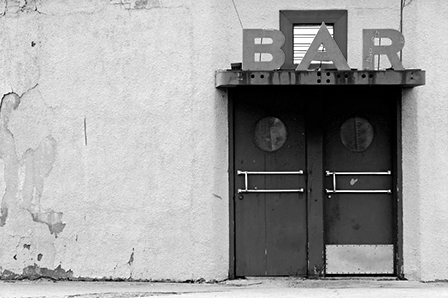 Speakeasies such as 21 Club and the Stork Club are tops on the list of nostalgic Prohibition memories. Jazz aficionados wax romantically about Harlem haunts such as Jerry's Log Cabin, the Savoy Ballroom, and the Cat's Corner, where Billie Holiday, Louis Armstrong, and other greats performed. 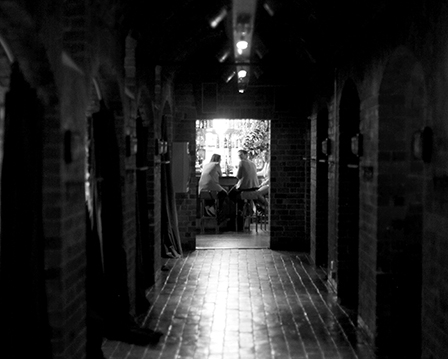 Just like their beer garden predecessors, drink was only one of a speakeasy's attractions. Food, jazz, comedy, cocktails, and in some places a dress code made a night out something special to those who could afford it. Most of Detroit's income came from car manufacture. But during Prohibition, its next largest industry was booze. Situated a stone's throw across the Detroit River from 45 legally-operating distilleries and breweries in Ontario, Canada, 25,000 blind pigs popped up to join the speakeasies and country clubs that serviced the city's elite corporate clients. Chicago generally ignored Prohibition from its inception. Populated largely by Irish, German, Poles, and Italians, the city was governed by politicians who were frequently in the pockets of vice lords. It's no wonder that some of the city's saloons - such as McGovern's Saloon and Café - never bothered to close their doors. Chicago's estimated 10,000 speakeasies and blind pigs were supplied by two organised crime factions. The notorious Levee District on the Near South Side was where illegal booze, gambling, prostitutes and organised crime were unabashedly served up since the 1893 World's Columbian Exposition. (The district's two aldermen were also owners of a few saloons and brothels.) Even though the Levee was in decline after the First World War, it was the prime stomping ground for Big John Torrio and his right hand man Al Capone. They united the numerous gangs south of the Chicago River who trafficked moonshine, bathtub booze, beer, and smuggled Canadian whiskey and Caribbean rum. Across the river on the Near North Side, the North Side Gang dealt in the real lager produced at the half dozen neighbourhood breweries including the Sieben Brewery of Chicago and the Peter Hand Brewing Company. It also had a very tantalising commodity: bonded warehouses filled with real American whiskey, such as the Sibley Warehouse & Storage Company and The Railway Terminal Ware House Company which they hijacked on more than one occasion. These two bitter rivals became infamous for their bloody shoot-outs as they fought for control of the virtually lawless city. Trapped in the middle was an increasingly terrorized populace. Gun crime was rampant. These times were not easy for honest working people. Yes, it was enough to drive them to drink. However, not everyone from every walk of life was fortunate enough to afford a private stock of imported booze, a whiskey prescription, the password to a speakeasy or blind pig, have a moonshiner or a gangster in the family, let alone afford a visit to a blind tiger. 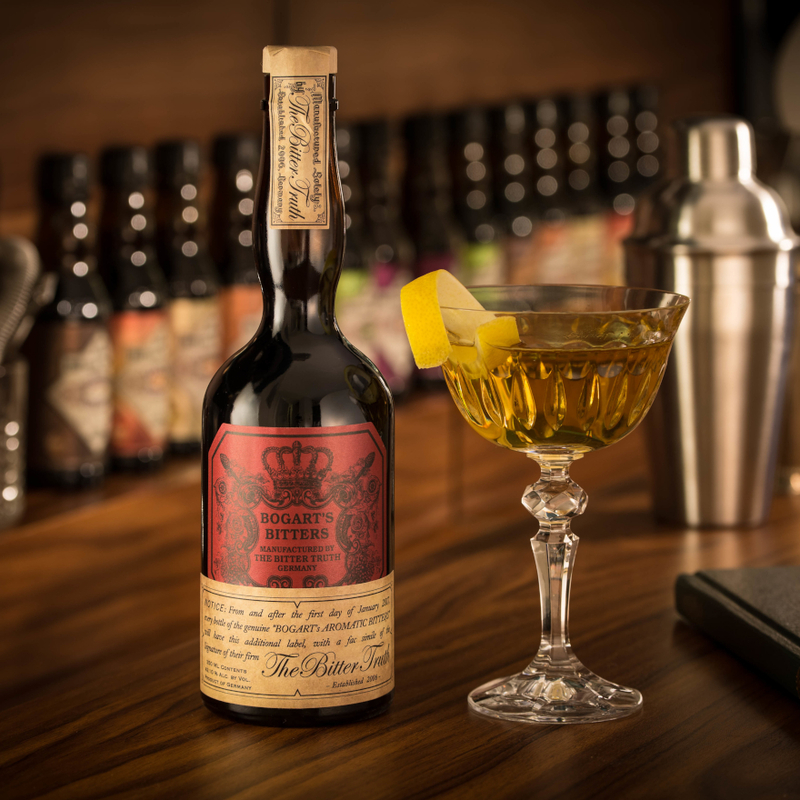 Bay rum and patent medicines such as Dr Samuel Brubaker Hartman's Peruna (which weighed in at a hefty 28% abv and at one time was generally known as "Prohibition Tonic") may have taken the edge off for some imbibers. But these liquids also caused severe diarrhea, stomach cramps, kidney failure, and other maladies. The saddest cases involved the imbibing of Jamaican Ginger Extract nicknamed "Jake". An early patent medicine, Jake was 70-80% abv and in of itself was not dangerous. Jake and Coca-Cola became a popular drink amongst the impoverished and recent immigrants. 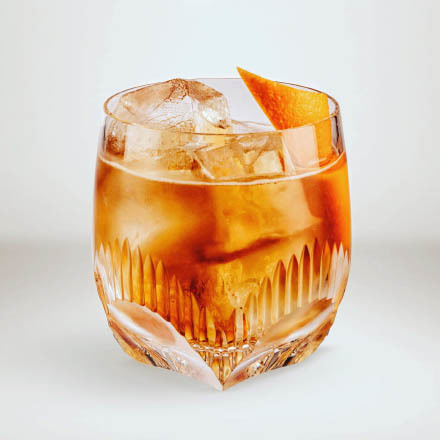 Then the US Treasury Department, noting that Jake had the potential of crossing prohibition laws, required manufacturers to add at least 5 grams of ginger solids per cubic centimeter of alcohol. This made Jake difficult to drink. Some moonshiners simply replaced the ginger solids with a small amount of ginger and either castor oil or molasses to pass inspection. But Boston moonshiners Harry Gross and Max Reisman of Hub Products found a new additive: tri-o-tolyl phosphate (TOCP), used in the making of varnish and lacquer, was also called Lindol. It passed government tests for use in beverages and medicines, and consumers found it more palatable. There was a hitch. TOCP contained a neurotoxin that irreparably damages the nervous system, particularly the spinal cord. A man staggered into the Reconstruction Hospital in Oklahoma City, on 30 February 1930. Dr Ephraim Goldfain attended him: the man's feet dangled like a marionette's; his legs were numb, limp, and functionless below the knee. By day's end, several more men appeared with the same condition. One victim, who was also a podiatrist, handed Goldfrain a list of 65 patients that he himself had attended. The cause was as yet a complete mystery, and the epidemic spread, especially in the East, South, and Midwest. It seemed to affect the poor and immigrants living in seedy neighbourhoods. Victims lost control of their leg and hand muscles within one to three weeks after drinking Jake. Some men were rendered permanently impotent. Some were paralysed. "Jake walk," "jake leg," and "jake paralysis" entered the common language. The victims were primarily from the lower rungs of society, and the government was slow in responding to this crisis. They finally tracked down the source of the thousands of gallons of Jake and, in December 1930, indicted Gross and Reisman. No one will ever know how many victims Jake actually claimed. No one knows how many people died. The estimation that 30,000 to 50,000 poor or poverty-stricken victims were afflicted from coast to coast is the only statistic that has been released. Compare that to the recent pan-European panic when twenty people died from an outbreak of E. Coli. The 1929 stock market crash and ensuing Great Depression didn't make it easy for regular folks to abstain from drinking. Couple the crippled economy and rampant unemployment with organised and publicly violent crime, ethnically-biased law enforcement, corrupt government, deaths due to uncontrolled, toxic liquor, court and prison systems that couldn't deal with overloaded dockets, and normal citizens who simply didn't agree with the right-wing extremists they had gullibly voted into power. America became a third-world nation filled with an oppressed majority ruled by crime lords and corrupt politicians. The reality of prohibition was more Batman Begins than The Thin Man. Many of the women who had previously fought for prohibition and suffrage campaigned for repeal. Pauline Sabin, a New York socialite active in Republican politics, once commented that: "I felt I should approve of it because it would help my two sons. The word-pictures of the agitators carried me away. I thought a world without liquor would be a beautiful world." But then she realised that the men who supported strict enforcement of prohibition drank cocktails behind closed doors. She also came to the epiphany that "children are growing up with a total lack of respect for the Constitution and for the law." She formed The Women's Organization for National Prohibition Reform (WONPR) in Chicago, in May 1929, along with the wives of some of America's industrial leaders. Many middle-American middle class housewives saw it as an opportunity to hobnob with the "hoy-poloy". Others were disenchanted that promised the utopian society had turned out to be more of a purgatory. Membership grew to 1.5 million within two years, embracing women from all economic levels, and branched out to chapters in 41 out of the 48 states. The WONPR was not alone. It was joined with The Association Against the Prohibition Amendment, Voluntary Committee of Lawyers, The Crusaders, and the American Hotel Organization united with the WONPR to form the United Repeal Council, which lobbied at both the 1932 Republican and Democratic conventions. Eight other national and regional special-interest groups placed additional pressure on both national and regional levels. Ultimately, the Republicans continued to defend the Great Experiment. So the WONPR and other initially nonpartisan organizations joined the Democratic presidential campaign and stumped for its platform: The repeal of Prohibition. Was it really a surprise that former the Governor of New York Franklin D Roosevelt won the 1932 presidential election? In the depths of the Great Depression, he promised a New Deal of economic relief and recovery programs as well as reforms of the banking system and stock market. He also ensured repeal of Prohibition. Congress took the first step on 20 February 1933 when it proposed the Twenty-first Amendment. It was a first. It was the only constitutional modification passed to explicitly repeal a previous amendment. And it was also the only one to be ratified by one-state, one-vote national referendum. It completely bypassed ratification by individual state legislatures. In other words, the voters had their say not the politicians. 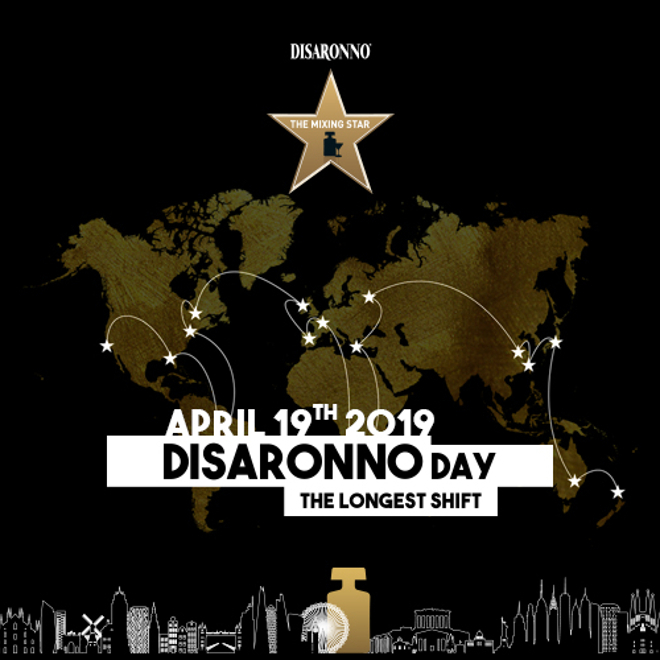 Roosevelt took the next step on 22 March 1933 by signing the Cullen-Harrison Act, which authorised the production and sale of both wine and 3.2% beer. One might think that with repeal beer, wine, and liquor flowed in an endless, high-quality stream. In truth, post-Prohibition alcohol that the average person drank was far below average quality. Repeal was a bittersweet victory for American whiskey distilleries. Those who had managed to stay in business, and to maintain their disused stills for over a decade, now faced a cavalcade of challenges. They lacked capital and credit. Many of their skilled workers had retired or died without passing on their knowledge to the next generation. Even when the stills were up and running, the first whiskey would not be ready to sell for years as it needed to age in barrels. Anything they could produce quickly had to be sold at low prices as the nation was still recovering from the Great Depression. One more blow dashed the hopes of many American liquor producers against the rocks of reality. Three years of drought and soil-starving farming practices introduced by the invention of the tractor triggered an environmental nightmare. Starting on 11 November 1933, a series of dust storms stripped what little precious topsoil remained on the ravaged fields of America's grain belt. The rains returned just in time for America to enter the Second World War, in 1941, and grain was pressed into service for wartime supplies. In fact, the production tailspin really didn't end until the early 1980s, when brand identity and brand calling became the trend du jour that demanded a return to higher quality and authenticity. 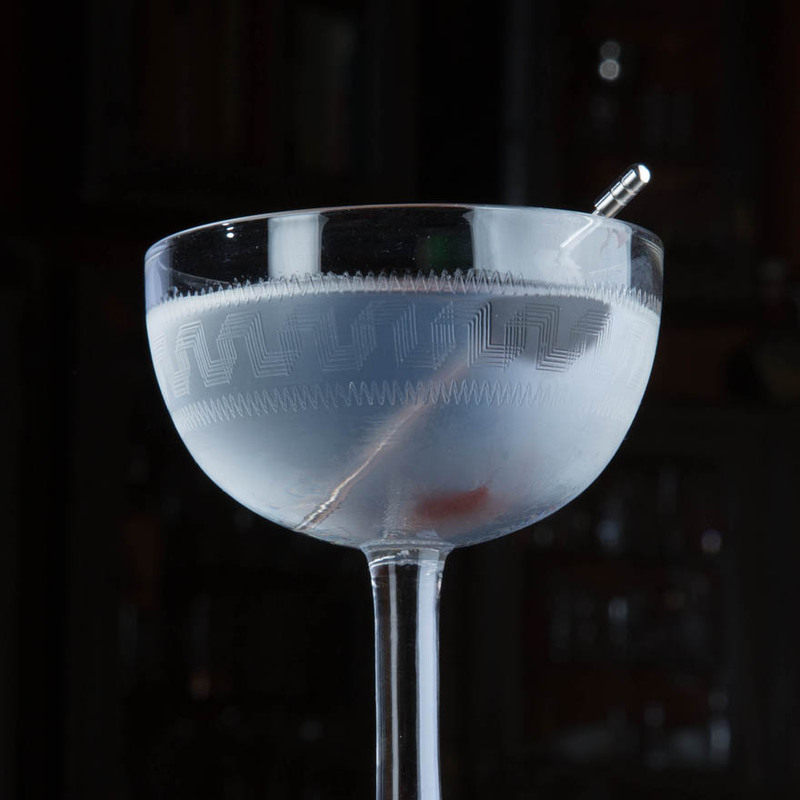 Confronted with poor liquor during and after prohibition, anyone who had taken up the bartending trade had to know how to disguise the taste of sour spirit. Appeal to the childlike sweet tooth was the answer: Sugary liqueurs and fruit juices predominated mixed drink recipes. Rum was the one spirit that didn't take a nose dive in quality, it was no wonder that tiki drinks shot up the charts amongst the Hollywood glitterati and Havana remained the playground for the rich and famous until the revolution. Organised crime had a firm grip on the rum market. Crime bosses "Lucky" Luciano and Meyer Lansky simply expanded the relationship with Cuban distillers that they had established during Prohibition. They not only invested in a new glut of Cuban casinos and hotels and paid off the island's president. When Cuban distillers moved operations to the US Territory of Puerto Rican to avoid importation excise on Cuban rum, their American distribution channels poured the rum into the restaurants, hotels, casinos, and nightclubs that they influenced on the mainland. Meanwhile, President Franklin D. Roosevelt's son and President John F. Kennedy's tycoon father Joseph secured distribution rights and had a fleet of ships waiting off shore that flooded the market with Scotch whisky before the ink was dry on repeal. Kennedy bought Canadian importation rights from Schenley Industries, and Canadian whiskey poured south. Thus, American distilling's post-prohibition recovery was long and painfully slow. Even though ratification was completed, on 5 December 1933, by 36 states, there were still detractors. Both North and South Carolina rejected the amendment. With repeal, the federal government washed its hands of liquor control, handing the power to state and local authorities. Today, there are 19 states that hold a monopoly on liquor sales. And there are still "dry" counties, towns, and villages in the United States. Was Prohibition the flapper-happy, speakeasy-silly joy ride that ended with President Roosevelt shaking a Martini in the White House on the night when repeal was ratified? Obviously not. The industry is still recovering from the damage done, a recovery that is in part due to bartenders rediscovering pre-Prohibition recipes and practices and returning professionalism to the trade. And in what form does Prohibition continue in America today? Eighty years later, there remain over 200 dry counties that partially or completely restrict alcohol consumption. There are also many more areas where cities and towns within dry areas have voted to allow alcohol sales, making them "moist" or partially dry. Twelve states still ban Sunday spirits sales, including: Alabama, Indiana, Minnesota, Mississippi, Montana, North Carolina, Oklahoma, South Carolina, Tennessee, Texas, Utah and West Virginia. Notably, Indiana remains the only state in the country which still bans all beer, wine and spirits sales at package stores on Sundays. Six states still ban all forms of spirits sampling in retail environments, including: Alaska, Georgia, Montana, North Carolina, Oklahoma, and Utah. Every year, however, many dry places are slowly voting to allow alcohol sales, mostly because they fear losing business to neighbours who aren't restricted by such laws.